This tropical shrub is readily available and easy to grow. It blooms continuously when temperatures are warm, producing large flowers (8-12”) lasting one day. The shiny green leaves compliment any landscape. 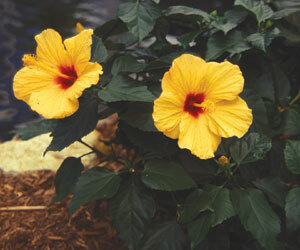 Hibiscus prefers full sun and rich moist soil. Don’t let it dry out. Fertilize monthly. It can be overwintered as a houseplant if high light is available or allowed to go dormant and stored in a cool area for the winter. Keep it on the dry side to maintain dormancy. Bring it into a warm area, prune it back, and water well to start regrowth in the spring. Place outside after frost. Makes a great container plant.